Average gross and net monthly earnings increased by 11.3% year-on-year in March 2018, falling short of wage growth in the last two months and slightly below market expectations. Wages increased by 8.6% YoY in the business sector and by 19.3% YoY in the public sector. While the growth rate of earnings in budgetary institutions was in line or even outperformed expectations, the business sector disappointed. A possible explanation could be that the wage structure of the business sector has slowly started to adapt to a lower rise in the minimum wage for skilled and unskilled workers (12% and 8%, respectively compared to the 25% and 15% in 2017). When it comes to the public sector, the main source of wage growth stems from the enormous increase (474% YoY) in premiums and bonuses. Regarding the demand for labour, the picture remains rosy. 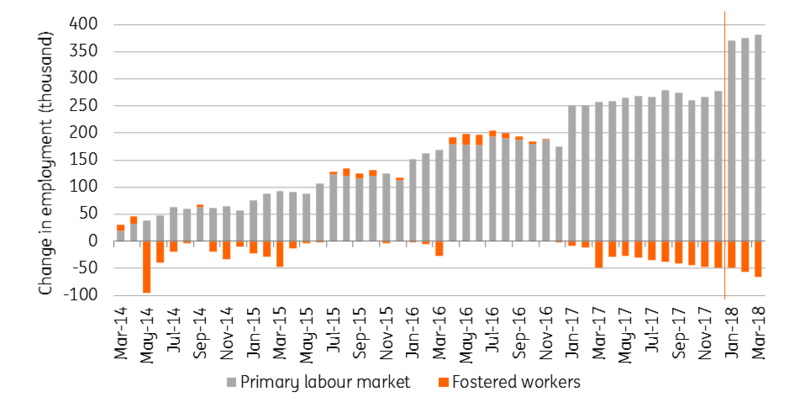 The number of workers in the primary labour market increased by 124k in a year while the number of fostered workers (employed by the government and paid less than minimum wage) decreased by 16.7k YoY to 132.6k. The first quarter shows favourable developments in the labour market with a dynamically increasing wage bill at the national level. 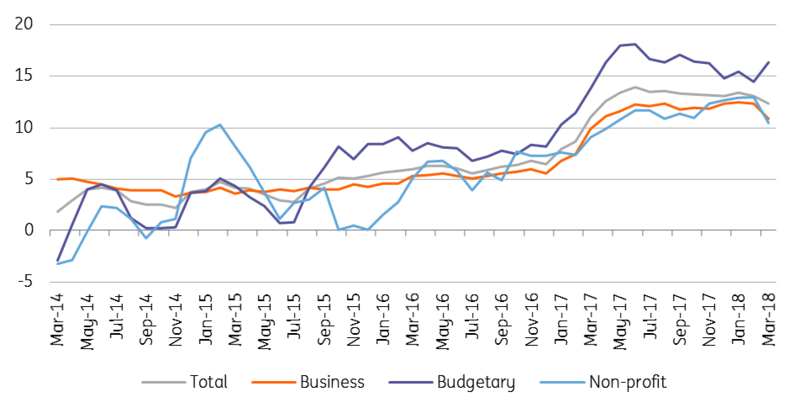 When it comes to the rest of 2018, we still see double-digit real wage growth as a possibility due to the significant labour shortage in the economy and the ongoing wage settlements in the public sector.